25. 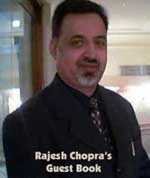 Aug.2007. Head of Brahamkumaris sect, Dadi Prakashmani left for heavenly abode today morning. She was in coma since last three days. Dadi 87 had a severe brain hemorrhage and was admitted to the Sterling hospital here. After she went into coma she was taken back to Mt. Abu the headquarters of the Brahmakumari sect, which has a large following. The cremation held on Monday morning 9.am. at Shantiwan. Ahmedabad, August 26: The death of Prajapita Brahma Kumaris’ chief Dadi Prakshmani is being mourned by the high and mighty. While President Pratibha Patil has expressed her grief on Dadi’s demise, Gujarat Chief Minister Narendra Modi along with his cabinet colleagues is attending her final rights. The funeral is scheduled at 10:30 am on Monday. Modi, along with his cabinet colleagues I K Jadeja, Ashok Bhatt, and Shivanand Ashram president Swami Adhyatmananda, is reaching Shantiban at Abu Road on Monday morning to attend her funeral. Nirma Group chairman Karsan Patel has already visited Shantiban and paid his respects. Shivratri Maharaj of Sutur Math at Mysore has also expressed his grief over Dadi’s death. A release issued from Prajapita Brahma Kumaris said that already more than 15,000 devotees had visited the Sanstha to mourn Dadi’s demise. 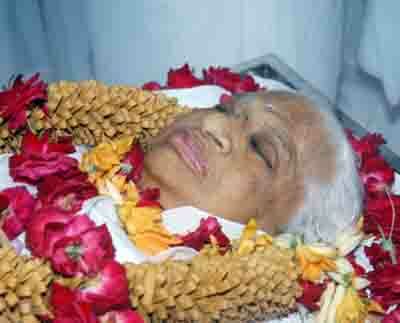 On Sunday, Dadi’s body was put up for public view at Shantiban at Abu Road. Mount Abu (Rajasthan), Aug 25: The administrative head of Prajapita Brahmakumari Eshwariya Vishwavidhyalaya (BKWSU), Dadi Prakash Mani, died here today after prolonged illness. She was taken to a hospital in Ahmedabad on August 21, where doctors said that there was a slim chance of her survival as she had suffered from brain haemorrhage. She was 87. On August 22, she was brought to Shanti Van Parishad situated in the premises of the Vishwavidhyalaya (university), where she died. Her last rites would be performed on Monday. BKWSU is an internationally recognised university and non-government organisation with around 4,000 branches in over 80 countries. The Brahma Kumaris offer people of all backgrounds an opportunity to learn meditation and deepen their understanding of universal principles and innate values through a variety of educational programs, courses and learning resources. In 1951, the university's world headquarters moved to Mount Abu in Rajasthan, where it remains to this day. In 1969, Brahma Baba passed away, 93, handing over leadership to Dadi Prakashmani as the administrative head of the organisation. Born in Hyderabad in the Sindh province of Pakistan, she joined the institution at the age of 14 and was chosen as one of the eight trustees during its formative days in 1937. From here she rose to become its chief administrative head after the demise of its corporeal founder Prajapita Brahma in January 1969. During her tenure, Bharma Kumari Prajapita expanded with over 8,000 centres in 130 countries, and went on to become an NGO member with the United Nations. She was also the recipient of the UN's International Peace Messenger Award. She was also conferred Doctoral Degree in Literature by Mohanlal Sukhadia University, Udaipur for her contributions towards promotion of human values and moral education. 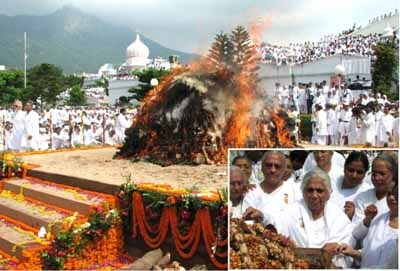 Governor Naval Kishore Sharma and Chief Minister Narendra Modi expressed their grief over Dadiji's demise. Modi in his message said Dadi had fought her entire life against the evils of society and succeeded in her efforts. The Governor also said Dadi was a living example of love and kindness and her death will be deeply felt by humanity. Leader of Opposition in the Assembly Arjun Modhwadia expressed grief over the sad demise of Prakashmani. Modhwadia and GPCC president Bharatbhai Solanki said that she contributed significantly towards the spiritual and social growth of the State and her absence will be felt deeply. Dadi Prakashmani has served on a number of international committees, hosted a series of global conferences and received various honours and medals. In 1984 she was awarded a UN Peace Medal for services rendered to world peace. She holds an honorary Doctor of Literature Degree from the Mohanlal Sukhadia University, Udaipur, India for her outstanding contribution in the field of moral and spiritual education. She served as one of the Presidents of the Parliament of World’s Religions convened in 1993 and is a signatory to The Declaration of Global Ethics adopted by religious and spiritual leaders at that assembly.